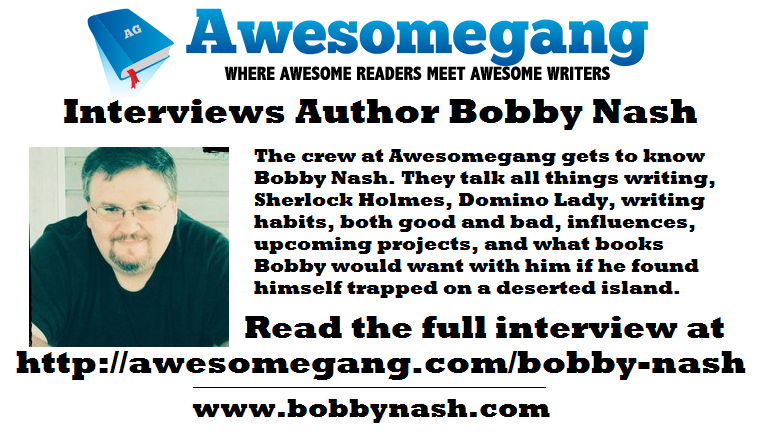 The Pulp Factory's own Bobby Nash was interviewed by the fine folks over at Awesomegang. They talked writing habits (the good, the bad, and the ugly), Sherlock Holmes, Domino Lady. influences, upcoming projects, and what books Bobby would want to have with him if he suddenly found himself stranded on a deserted island. "I'm thinking, as long as I had a laptop, electricity, and wi-fi, I'd be okay," Nash joked. "Thanks, Awesomegang. You're awesome. But then, you already knew that." --and we think he liked it! The Pulp Factory's own Bobby Nash said it was an honor to be the first interview for Tommy Hancock's new Venture Galleries' column, THE SMACK! "This was a fun interview, the first of many to come in this column in the weeks ahead," Nash said. "This was also the first time I've ever been compared to Fred Astaire, which is pretty darn cool. You'll have to read the interview to see how." 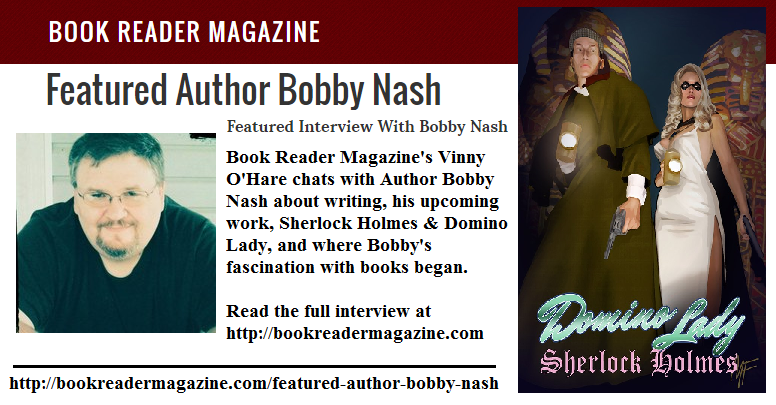 The Pulp Factory's own Bobby Nash was interviewed by Vinny O'Hare from Book Reader Magazine. 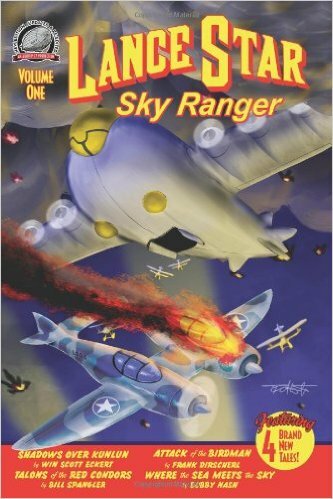 Book Reader Magazine is Your Home To Good Books and Good Authors. You can read the full interview here. 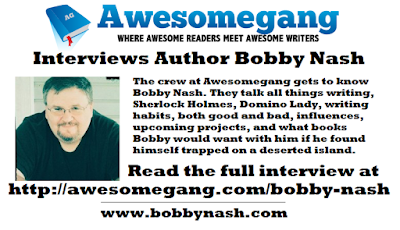 BOBBY NASH INTERVIEWED AT INTERVIEWS WITH WRITERS! The Pulp Factory's own Bobby Nash was interviewed by Deborah Carney for Interviews With Writers. You can read the full interview here. Airship 27 Productions is thrilled to announce the release of the fifth volume in their best-selling fantasy adventure series, SINBAD – The New Voyages. They are the most daring, courageous, fool hardy seagoing crew ever assembled. Foremost among them are Henri Delacrois, the French archer, Ralf Gunarson, the blonde Viking giant, the lovely female samurai, Tishimi Osara and Omar the irascible first mate. These are the colorful adventurers of the magnificent Blue Nymph. All pledged to follow their captain, the most famous sailor of all time, Sinbad El Ari. Now they return in four brand new fantasy tales by Barbara Doran, Ron Fortier, Lee Houston Jr. and Percival Constantine. They battle an old adversary in returning an aged wizard to his homeland, are threatened by deadly traps in searching for a long lost treasure and confront a shape shifting shaman on a mysterious south sea island. Terry Pavlet provides the stunning cover with Michael Dean Jackson the twelve black and white interior illustrations, all designed and assembled by this year’s Pulp Factory Award winner, Art Director Rob Davis. Readers of the previous four volumes have been clamoring more and here they are. Set against the backdrop of far-off exotic lands filled with magic and mystery. 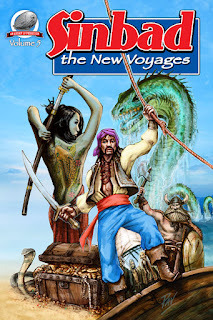 Here are epic tales worthy of this legendary hero, Sinbad the Sailor! Available from Amazon in both hard copy and Kindle.